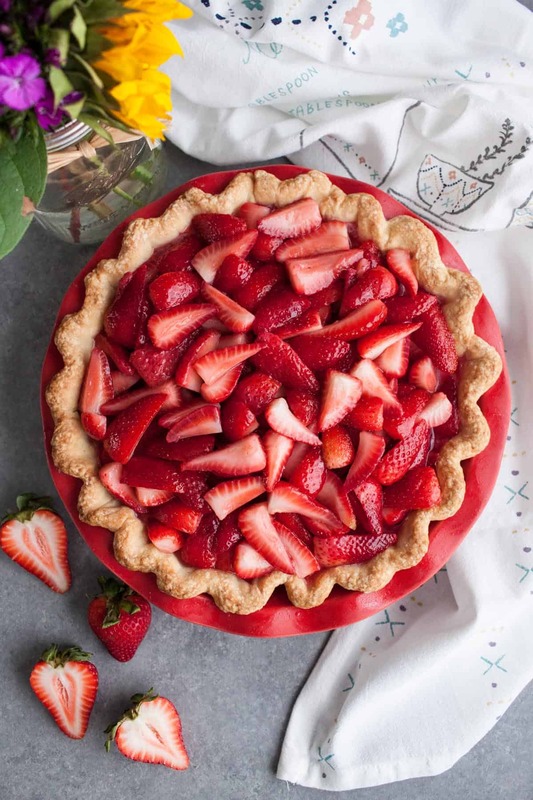 A flaky and buttery pie shell is filled with a delicious cream cheese and whipped cream mixture, then topped with macerated strawberries to make this heavenly Strawberry and Cream Pie. 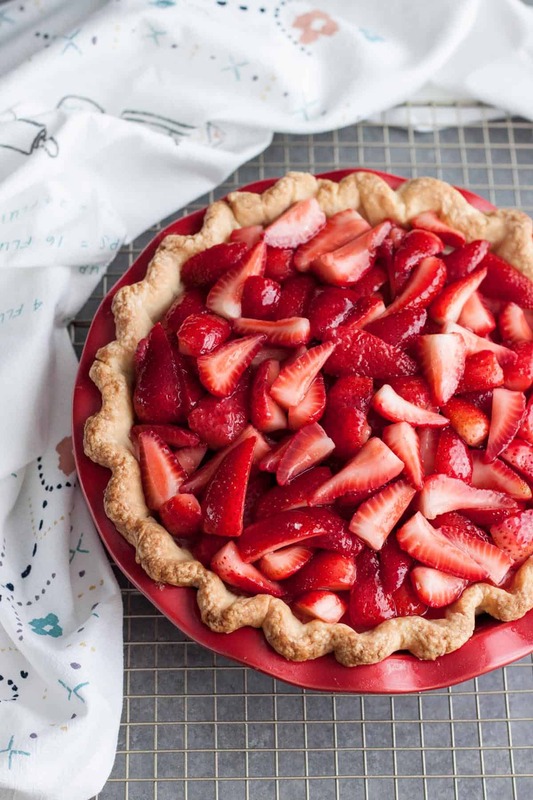 This pie will become a stable summer pie on your menu for years to come. 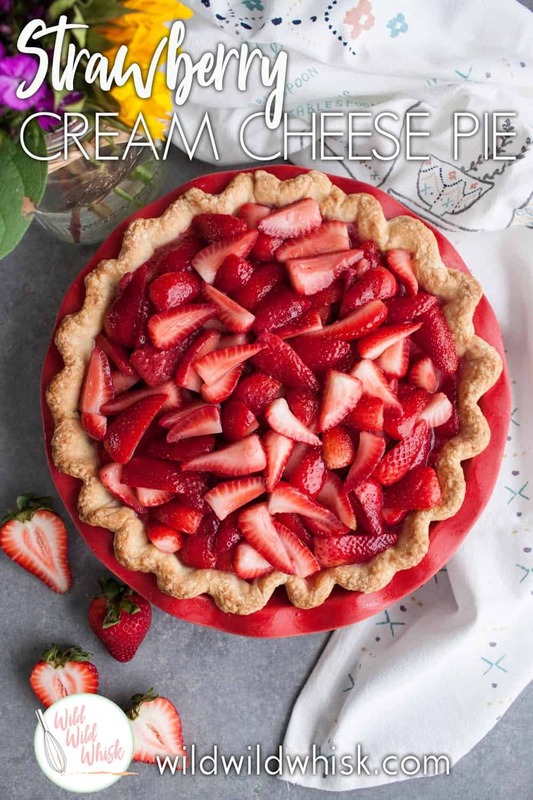 This Strawberry and Cream Pie was originally published on August 4, 2014, about two months after I started this blog. 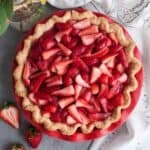 It is one of my favorite pie recipes that I make over and over again. 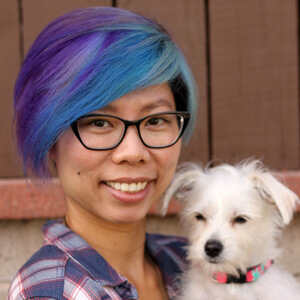 After almost 4 years of blogging, my photography has improved significantly and I’ve decided to update this post with new photos, better step by step process, and more thorough instructions. So without further ado, let’s get on with it. Last week, I posted a step by step tutorial on How to Make an All-Butter Pie Crust. You will be using a batch of that flaky and delicious pie crust in this recipe. Refer back to the tutorial if you need a little refresh on how to make homemade pie crust. You can also opt to use pre-made pie dough to save time. The strawberries can be prepared ahead of time, I usually make it the night before. Or at least, it should be the very first thing you make when starting this recipe since the fruits need time to soften. The pie crust needs to be baked to completion, since we won’t be baking this pie with the cream filling. It also needs to cool completely before adding the cream filling so we don’t melt the filling. The cream filling is a mixture of whipped cream and cream cheese. You can flavor it with vanilla extract or almond extract. Originally, I flavor it with vanilla extract, but since Ryan loves almond, I switch it up once in a while. Add the macerated strawberries on top of the cream, you can add the rest of the juice over the top if you wish. I usually reserve it and drizzle on individual slices when served. The inspiration for this pie came from a peaches and cream pie we bought from Polly’s Pie many years ago. It will forever be the best cream pie I’ve ever eaten! The cream filling was just the perfect creaminess and cheesiness. Afterward, we came back every single year just to look for that exact same pie, but they never brought it back. So I was on a mission to recreate it. Instead of peaches though, I ended up with this Strawberry and Cream Pie. And it is just as delicious! Wash and hull the strawberries. Quarter the big ones and halve the small ones. 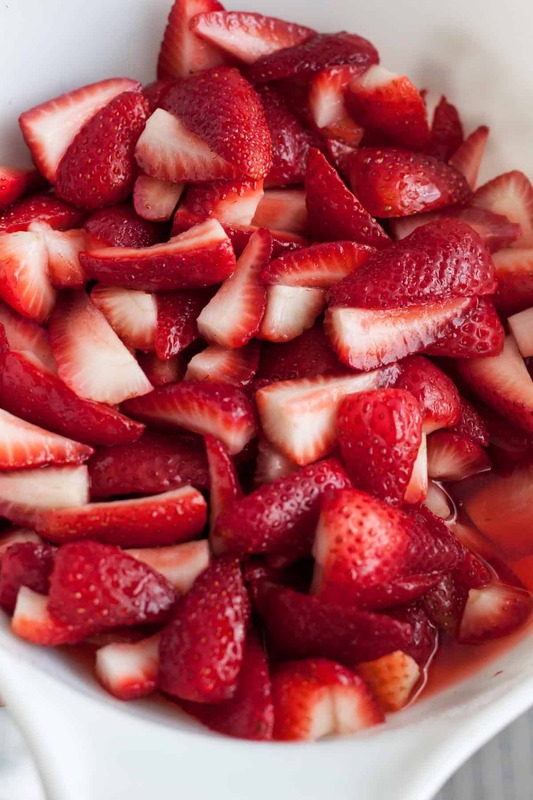 Toss strawberries with 1/4 cup of sugar in a large bowl, cover and refrigerate until needed. Take pie dough out of the fridge and roll into a circle about 2” larger than your pie dish. Use extra flour to keep dough from sticking to the counter and roller. Carefully place the dough over the pie dish, lightly press the dough into the bottom and side of the pie dish, let the excess dough hang over the side. Trim some of the excess dough if necessary to create an even edge, but leave enough to fold under and flute the edge. Cover the prepared pie dough with plastic wrap and freeze for 10 - 15 minutes. 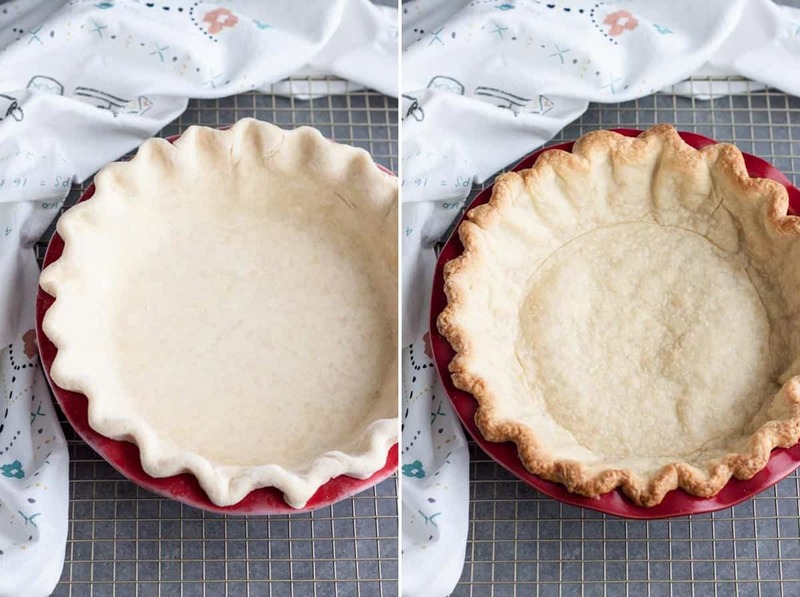 Take the frozen pie crust out of the freezer and poke holes with a fork on the bottom and side. 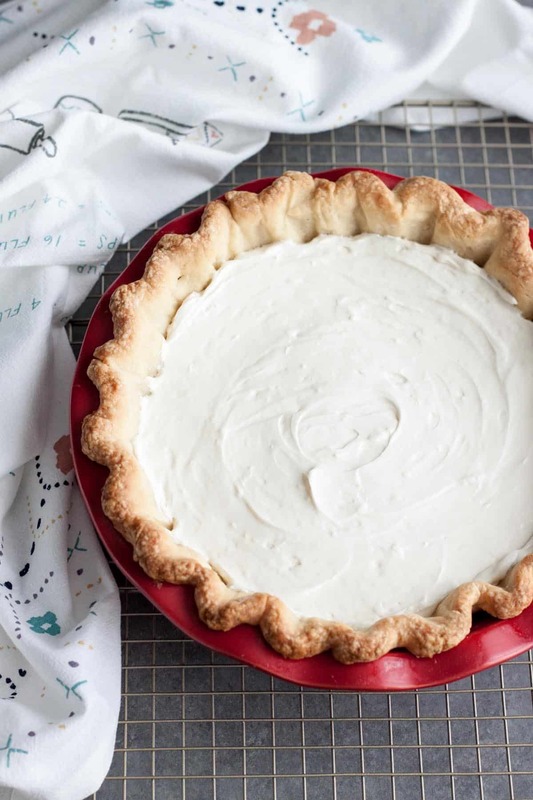 Line the frozen pie crust with parchment paper, large enough to cover the crust completely. Add pie weights or dry bean on top of the parchment paper, enough to fill to the top. Bake pie crust for 20 minutes. Remove pie weights or bean, and bake for another 10 - 15 minutes until golden brown. Remove from the oven and let cool completely on a wire rack, about 2 hours. In the stand mixer bowl, beat the heavy whipping cream to stiff peak. Transfer to another bowl and set aside. In the same stand mixer bowl, cream the cream cheese with sugar and vanilla (or almond) extract until smooth. Add the whipped cream back in, and set the mixer on “stir” or fold by hand using a spatula until thoroughly mixed. Cover and refrigerate until needed. Spoon the cream mixture into the cool crust; level out the top. Then spoon the strawberries on top of the cream using a slotted spoon. 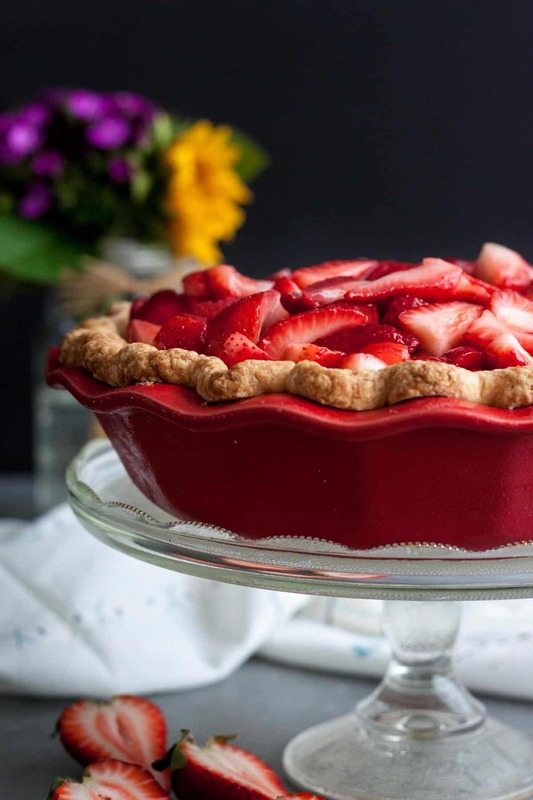 Drizzle the strawberry juice over the top or reserve the juice to drizzle over pie when served. If using premade frozen pie crust, bake according to instruction that comes with the dough. This is such a gorgeous pie! 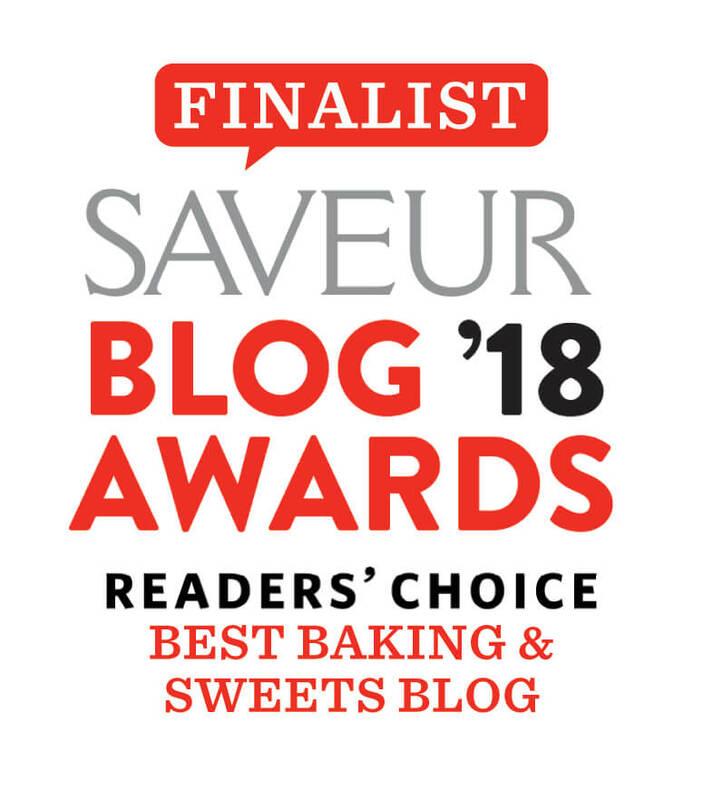 I love strawberry desserts! Great! How clever using dry beans as pie weight. Who’d of thunk it?